We just finished up our annual June celebrating marathon. It always seems like everything happens this month and we end up over-indulging in party food. Rather than keep the trend going, I’m planning to make some really fresh, seasonal meals for the July 4th weekend, including this salad. We’ve had really beautiful berries in the stores lately so this will be a perfect accompaniment to any grilled meal we cook up this weekend. 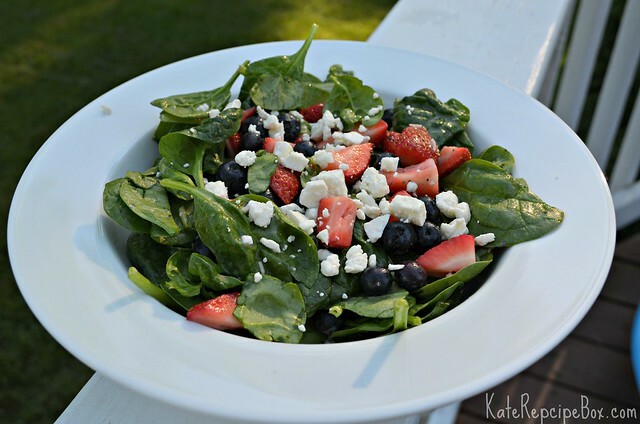 In a large bowl, toss together the spinach and dressing until evenly coated. Toss in the berries and transfer to serving bowl. Top with feta. Serve immediately.